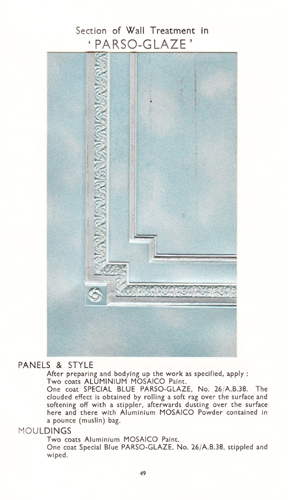 A previous post has already introduced the subject of a most useful work that was published in the 1930s – Parsons’ Decorative Finishes. Subsequently I have used it as a ‘prompt’ for posts dealing with Imitation Stone Paints, Permanent Greens; Gloss Enamel Finishes and several other types of paint. 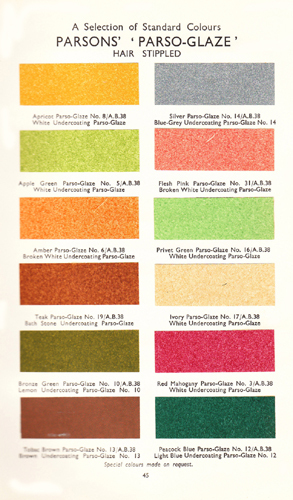 The book is divided into 17 sections and two of these refer to the tinted Scumble Glaze offered by Thomas Parsons at the time. 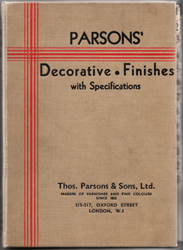 The first section of Parsons’ Decorative Finishes is headed Bill of Quantities and gives guidelines for anyone wishing to specify the paints contained in the book. (As this section is repeated below I will ignore these guidelines). Scumble glaze is a semi-transparent medium which is applied over a hard dry ground usually of a different colour in an eggshell or flat enamel. While the scumble is wet it is manipulated in such a way as to expose portions of the ground colour. The essential features of a scumble are that it should remain open long enough to be manipulated but should retain the markings made in it without flowing out. 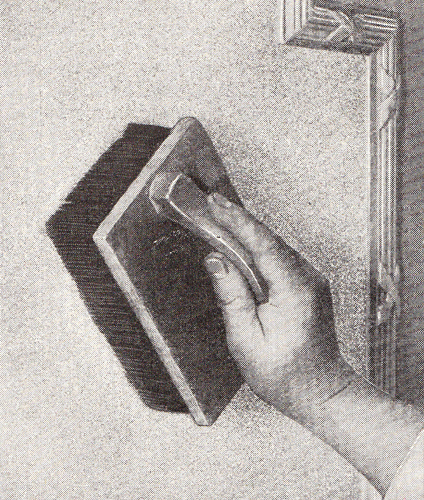 It is normally tinted, but in some ‘broken colour’ techniques (such as ‘Shading’) it is applied untinted. The spreading capacity was approximately 200 sq. yds. per gallon. a)	One coat of Parsons’ ‘Unicote’ Primer. b)	Two coats of Parsons’ Body White Undercoating Paint. c) One coat of Undercoating ‘Parso-Glaze’. d) One coat of ‘Parso-Glaze’ to approved treatment. a) One or two coats of ‘Parso-Glaze’ Undercoating. b) One coat of ‘Parso-Glaze’ Undercoating. c) One coat of ‘Parso-Glaze’ to approved treatment. One coat of Parsons’ Pale Copal Varnish. One coat of Parsons’ Extra Pale Dead Flat Varnish. *We recommend stippling these varnishes. 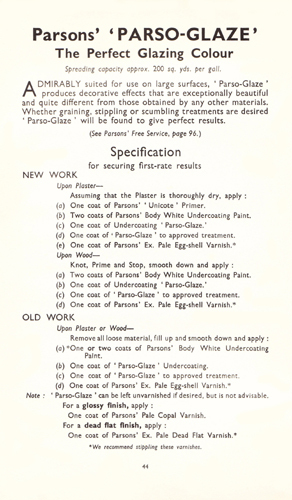 ‘Parso-Glaze can be left unvarnished if desired, but is not advisable. 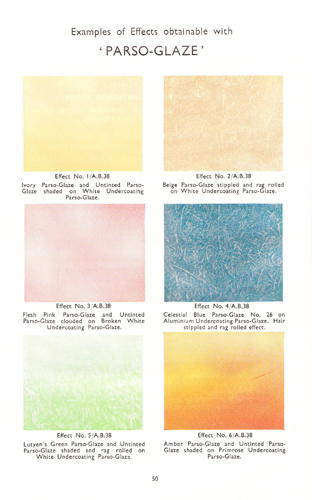 The methods by which ‘broken-colour’ effects are achieved include graining; brush graining; combing with steel or rubber combs; rag rolling; stippling with a bristle or rubber brush; rolling with crinkled paper and wiping with a soft cloth to reveal the highlights. When stippling, the brush is used to strike a surface that has had a coat of glaze applied to it. This is done repeatedly and systematically with the object of levelling out the glaze and removing brushmarks. Each stroke should largely overlap the previous one and this should be done in a straight line to ensure an even coverage. The effect of a fine hair stipple is rather like the skin of a peach. In the above illustration one can see examples of ‘Shading’, ‘Clouding’ and ‘Rag Rolling’ carried out over different coloured base coats, including a metallic one (centre right). One coat White Undercoating ‘Parso-Glaze’ was applied. One coat Ivory ‘Parso-Glaze’ was hair-stippled and the panel lightened towards the centre. 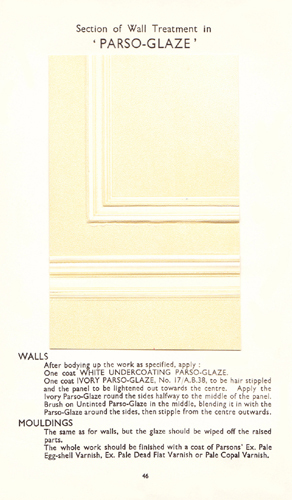 This was done by applying the Ivory ‘Parso-Glaze’ round the sides halfway to the middle of the panel. Untinted ‘Parso-Glaze’ was brushed on in the middle and blended in with the ‘Parso-Glaze’ around the sides then stippled from the centre outwards. One coat of Ivory ‘Parso-Glaze’ was applied and then wiped off the raised parts with a soft cloth. The whole work was then varnished. Two coats of Aluminium Mosaico paint were applied. One coat of Special Blue ‘Parso-Glaze’ was applied. The clouded effect was obtained by rolling a soft rag over the surface and softened with a stippler. The surface was then dusted over in places with Aluminium Mosaico Powder contained in a pounce (muslin) bag. Two coats Aluminium Mosaico paint were applied. One coat of Special Blue ‘Parso-Glaze’ was then applied before being stippled and wiped. Before applying an oil scumble over a metallic paint it was always a good idea to apply a thin coat of clear lacquer (white knotting thinned 50/50 with methylated spirit) first and allow it to dry. 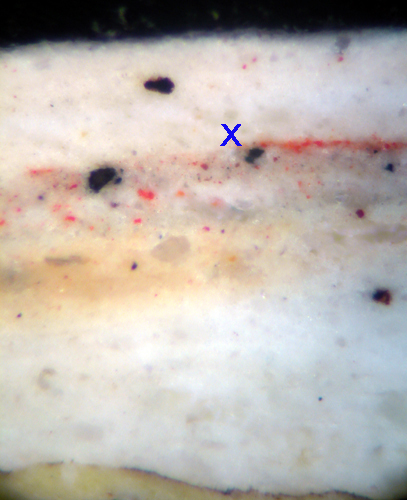 This ensured that the metal wasn’t ‘picked up’ and left floating in the glaze. Success in the achievement of good broken colour effects depends not so much on technical ability as on artistic sensibility. All too often they are carried out with a heavy-handedness that has earned them the title of “corned beef” effects. As with most fashions they come and go in cycles. The Second World War was partly responsible for their demise, but they had more or less played out – at least for thirty years. I came into the world of paint and colour in 1980 just as they were beginning to see a revival and was greatly involved in explaining the process to customers and assisting with various books on the subject. That lasted for a decade before overuse and inept handling led to a desire for plain colours, particularly of those ‘historically-inspired’.